Last weekend he was driving the broom wagon for the Mount Leinster Challenge, but today great Slaney CC clubman Frank Dunne took a long overdue victory in The Betty Darcy Memorial RR, and a big step towards regaining his S1 licence. With 4 SCC riders in the breakaway group of 14 which went away early in the race, it was a great display of teamwork that helped seal victory, with Frank O’Leary, Alex Williams and Murt Doyle all working incredibly hard to keep Frank in a great position for the sprint which he took from ‘supervet’ Sean Bracken. Tour: Great weather and a good turnout on todays tour which went towards the Carlow/Kilkenny border. About 80km covered at a good pace and and while we’re used to abuse from boy racers, today we had a run in with a couple of hardline Christians! 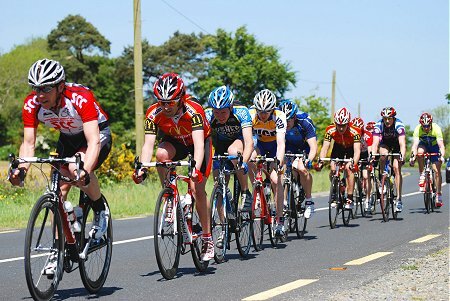 Finally, well done to fellow Wexford man Martin Gill who completed a really tough FBD Rás today riding in the Clonmel colours.